The CLNZ Education Awards “Teachers Choice” is now open for voting. 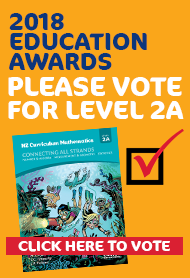 Caxton Educational has entered our NZCM Connecting All Strands Level 2A resource in the primary resources category of the CLNZ Education Awards, which celebrate excellence in New Zealand educational resource development. Voting is open from 19 June – 6 July 2018. After you cast your vote, you are in the draw to win one of five $100 book vouchers for yourself and a $100 book voucher for your school.